Posted on August 6, 2013 This might be outdated! Please start developing all your ‘snippets’ as woo commerce extensions. I would love to give you my money! This was just was I was looking for. But is there a way that I can get the code to select the related products I choose woo commerce? Right now I think that the code selects the products which are next to the selected product? I was wondering if it was possible to move the related products to sit under the single product short description? yes that can be done using custom coding and filters. This worked great, however, now I have related products in a tab and below the product tabs as well. Is there a way to hide just the div outside the tabs? I’ve tried to, but it ends up hiding both since they are both div.related.products.cols-2. I’m wondering if instead of “related products” a tab could be created for “up-sells” where up-sells for specific products would then be in a tab rather than the “You may also like…” at the bottom of the page. I’d also be interested if it’s possible to place up-sells in a sidebar widget instead of either a tab or page content. This is a really cool feature. Will you think about taking this further to allow for a more responsive layout and give the .woocommerce-tabs a custom column layout so I can list my related products below one another on mobile? The current layout for Related Products does not offer this. Perhaps your Tabs method could be a more suitable method. Just a thought and hoping you will consider this. I tried ‘woocommerce_instagram’ , ‘Woocommerce_Instagram_Frontend’ and ‘maybe_display_instagrams’ but without luck. Love this! I am trying to combine another code snippet forf changing the amount of Related Products to show along with your code to moving them into the tab. however I am still only seeing 2… Any Ideas??? 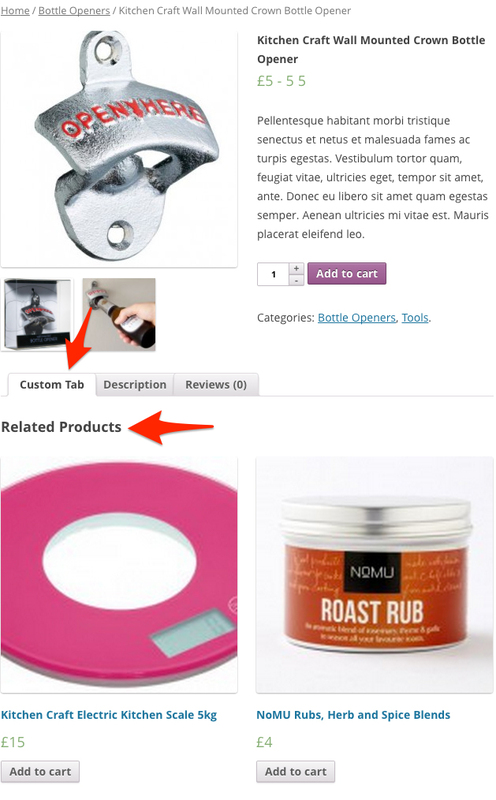 Would Also love to move the Custom Related Products tab to the third position??? Any ideas on that?